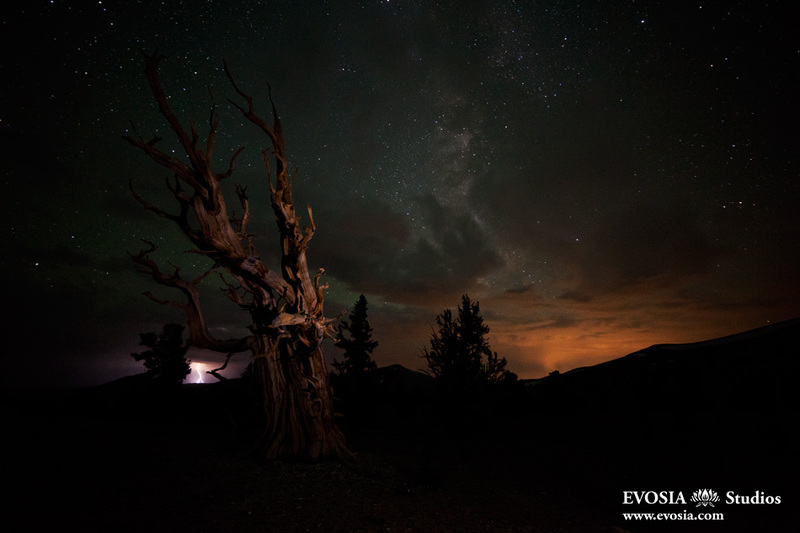 I was filming in the Ancient Bristlecone Pine forest on the night of July 3rd. I just experienced an amazing orange-red sunset and as the light was fading, the clouds looked like they were disappearing for a perfect night of clear skies to capture the Milky Way. But as the Milky Way started rising over the horizon, the clouds started coming back. They grew thicker and thicker, obscuring half the sky. I was here the night before when it was perfectly clear skies but I assumed the weather would be the same the next day. So I went to sleep and did not film. Now seeing the cloudy skies in front of me, I started kicking myself for not seizing the opportunity when it was there. Now it is gone. But I continued to film, not knowing what to expect. Perhaps it’ll get worse and I won’t be able to see anything at all. Or perhaps it may clear up over the course of the night. Either way, I am here. And I came all this way, 300 miles from Los Angeles and dragging 60 lbs of gear across a road closed to snow to be right where I am. With all my equipment set up and the camera shooting away, I went to sleep. I woke up in the middle of the night, around 2:30am, to a light drizzle. This was followed by a bright flash in the sky. I quickly jumped out of my sleeping bag, thinking that a thunder storm may be approaching. At over 11,000 ft on top of the White Mountains, it was not quite the safest place to be during an approaching storm. There was no shelter and my car was a 20 minute hike away. Luckily, as I saw several additional flashes of lightning, I could see that the storm was some distance away, in the Eastern Sierra Range. Mother nature can be unpredictable as it was that night. But I have found that if you are patient and wait it out, oftentimes you get rewarded with something great, something beyond your expectations. That night I was just hoping that the sky would clear up. And I stayed knowing that I may come out with nothing. But in the end I captured something even better, an electrical storm brewing 40 miles away. Like mother nature, the path my life has taken has been unpredictable, and at times very unpleasant. But in the midst of whatever challenges life threw my way, I knew it was important to continue to do what I love and strive to be the person I want to become. Had I run away or give up on myself when life got tough, I wouldn’t be where I am now nor be the person that I am. So before running away or giving up, whether it is about love, work or something else, consider the silver lining of the challenge facing you. You never know what reward awaits you if you can stick it out. Here’s to life and mother nature’s unpredictability. Posted on Monday, July 4th, 2011 at 11:10 pm. Filed under: Feature, Landscapes, Photography, Portfolio	RSS 2.0 feed. We chatted briefly while you were walking up to Patriarch grove on the 3rd. Was this picture taken that night? This is wonderful.